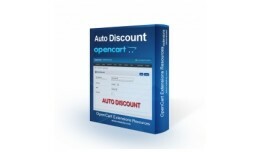 Description This contribute Auto Discount as opencart plugin to extend the opencart avaibility to auto discount when subtotal reach the preset limit. 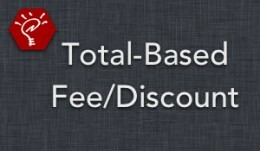 Features Flat rate or multiple ranges base discount Date schedule to activate/deac.. 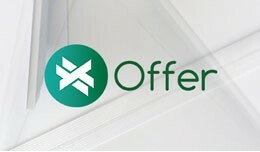 Description This contribute MultiPaymentFee as opencart plugin to extend the opencart avaibility to include payment fee in order to minimize the merchant lost. 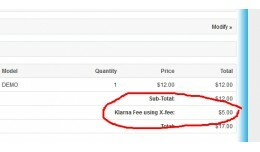 The module is helping to offset the transaction fee incur to the payment gate..
People'sCode Order Fee / Discount Apply fees / discounts or automatic shipping fee subtraction in cart, during checkout and when creating / editing orders, based on: Shipping method. Payment method. Customer's Group. 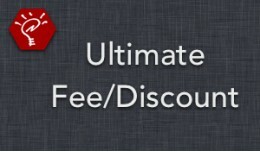 Customer's paym..
Discount/Fee based on Amount, Group, GeoZone, Sh.. 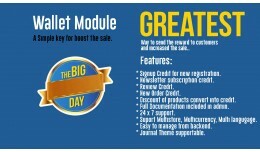 This module helps to boost the sale of store. Cashback/Wallet Features - Cashback earn for actions and orders Auto calculate cashback and credit to customer wallet Credit on Customer Birthday. Admin have full control on same. Capping on ne.. 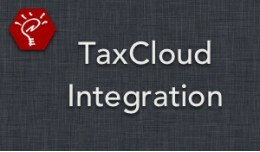 Reward Point, Cashback, Wallet, Loyalty, Birthda..
OpenCart Versions: 1.5.2.x - 1.5.6.4 Full Resolution Images: Available at the OpenCart forums Integrate your OpenCart store with TaxCloud, the easy-to-use sales tax management service for retailers. This extension connects Open.. 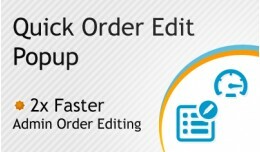 Original Price: $21 30% DISCOUNT PRICE: $15 This Extension allow to edit orders in popup window without opening order edit page, easy and fast order modification Features ★ Easy Installation ★ Does not overwrite any master file.. 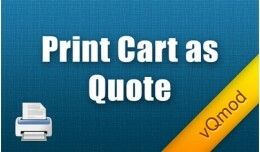 Original Price: $21 30% DISCOUNT PRICE: $14 This Extension allow to print Customer/Guest their shopping cart as a Quote. Features 1. Easy Installation 2. Does not overwrite any master files 3. Free Support 4. 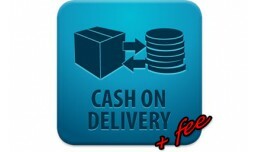 Store Logo to Shoppi.. 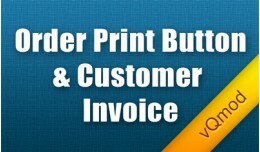 Original Price: $19 30% DISCOUNT PRICE: $13 This Extension displays Print Button to Registered Customer & Guest Checkout Success Page, Order History list page & Order Info Page. What's New.? 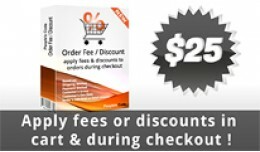 (11/11/2015) ★ Upgraded to Version 2.0..
Order Print Button in Success, History page - SA..
With this extension you can apply a fee to the Cash on Delivery. 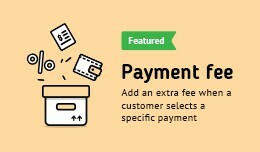 *** Features: - apply a fixed or percentage fee to COD - can set an "order amount" for no fee - can set an "order amount" to disable the COD payment - can set a min and/or a..
(COD Fee) Cash on Delivery Fee / Supplemento Con..
✪ OVERVIEW ✪ With this extension you'll be able to set fee or discount to all payment methods available. 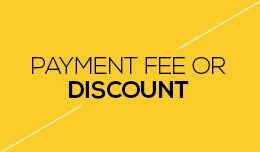 You may set a fee in percent to one method and discount in fixed value for another one and they'll be applied accordingly. 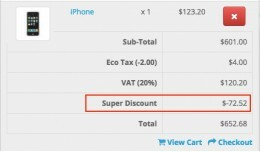 ✪..
Super Discount enables discount or fees to be set based on rules in cart. 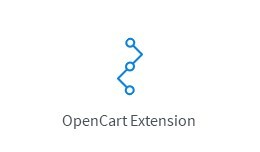 This extension enables store owner to setup multiple discounts or fees on the cart total based on specific rules such as Products, Options, Categories, Manufacturers, C..
OpenCart Versions: 1.5.2.x - 1.5.6.4 Full Resolution Images: Available at the OpenCart forums Create fees and discounts based on the cart total! This extension uses an intuitive "rules" system to easily determine when your char..
OpenCart Versions: 1.5.2.x - 1.5.6.4 Full Resolution Images: Available at the OpenCart forums Create fees and discounts based on any criteria you want! This extension uses an intuitive "rules" system to easily determine when you..